Chief Election Commissioner T.S. Krishna Murthy today gave clear indications that the Lok Sabha elections would be completed by the second week of May and advised the political parties to adhere to the model code of conduct even before it formally comes into force. New Chief Election Commissioner T.S. 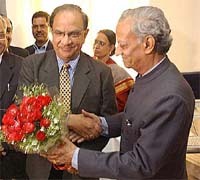 Krishna Murthy (left) with new Election Commissioner N. Gopalaswami at Nirvachan Sadan in New Delhi on Sunday. Do you think that the lowering of fees at the IIMs will have an adverse effect on quality? Short of making a formal announcement, the national BJP President, Mr M. Venkaiah Naidu, today left no room for doubt about an imminent breakup between his party and the Indian National Lok Dal at the “shankhnaad rally” organised by his party here today. 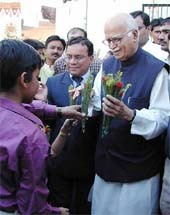 Kicking off the BJP’s election campaign for the Lok Sabha poll in Gujarat, Deputy Prime Minister L K Advani today sought a fresh mandate for the NDA at the Centre to fulfil its unfinished tasks which included building a Ram temple with the consent of Hindus and Muslims. The Congress today demanded the arrest of Civil Aviation Minister Rajiv Pratap Rudy and a comprehensive probe by the CBI regarding his holidaying in Goa allegedly at the expense of the Airports Authority of India. Senior officials from India and Pakistan today rejected signing the Nuclear Non-Proliferation Treaty but vowed their countries would still fight the spread of nuclear technology and weapons. Pop star Daler Mehndi will now be asked to record his statement by Patiala Senior Superintendent of Police A.S. Rai regarding the alleged incident in which he was asked to pull down his trousers for identification purposes by members of the Special Investigation Team which had called him for questioning in the human trafficking case registered against him. Nineteen people, including nine militants and three soldiers, were killed in Jammu and Kashmir during the past 24 hours. A three-member Indian delegation, led by the Rajya Sabha Deputy Chairperson Najma Haptullah, will arrive here tomorrow to attend a regional meeting on the advancement of rural women.